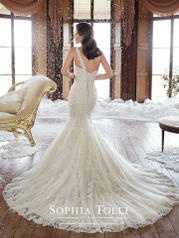 One-shoulder light tulle and lace trumpet gown Rory will create a striking moment on your wedding day. Beautifully hand-beaded lace appliques are delicately placed throughout the bodice and trail down the skirt while a complementary crystal brooch adorns the shoulder and a beaded lace strap asymmetrically adorns the back bodice. A chapel length train with matching hem lace and back corset complete this stunning gown. Also available with a back zipper as style Y21501ZB.